Over the past two weeks, Cinema Lorosa'e has had some last-minute schedule changes for the best-possible reason: we were invited to screen at some special events. As our reputation spreads throughout the country, there's a growing feeling that a movie screening is a great way to end a day's work - or sport. So last weekend we were excited when the call came from the Timorese Horse Racing Association, the ACPCC-TL, with an invitation to show a film after the inauguration of Timor-Leste's brand new race track in the border town of Batugade. Horse racing is a strong Timorese tradition; often to reach remote areas across the rugged mountain landscapes the only way to travel is on horseback, so equine handling skills come naturally. 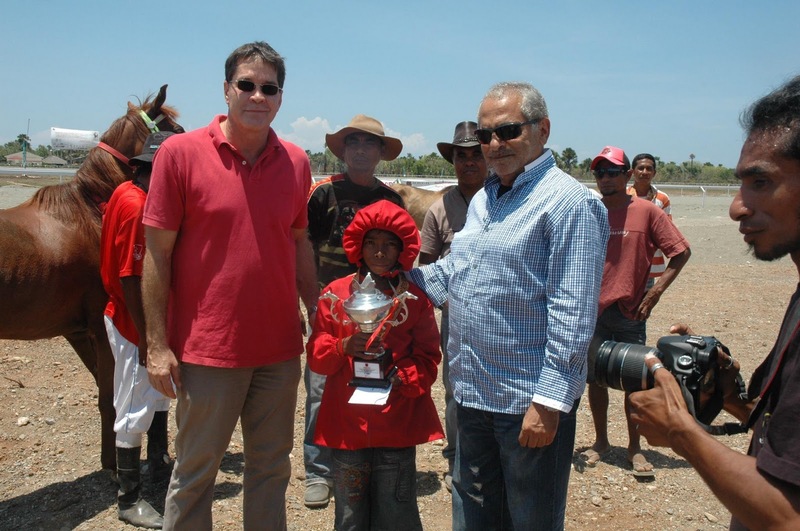 At the inaugural event for the Batugade Hippodrome (billed as "the Ascot" of Timor-Leste, after the famous race in England) both the Prime Minister, Xanana Gusmao, and the President, Jose Ramos-Horta had their own horses competing in the races. When his ceremonial duties were over, President Ramos-Horta also found time to watch the movies: the premiere of an appropriate short film about a young girl who is a jockey, followed by the evening's feature, "Gulliver's Travels". We were glad that the President had the opportunity to see the screen - which is on loan from his office - put to good use. So many people gathered to watch the movie - around 5,000 - that it was simply impossible to count them. It's impossible to photograph a 5,000-strong crowd in the dark! The previous week's screening also coincided with Ramos-Horta's schedule: this time we were invited to show a movie in a tiny mountain village called Maubara-Lissa, where the population of 7 other nearby villages was gathering for an impending visit by the President and the Minister of State Administration. We were originally planning to hold our screening in Gleno, Ermera, but all of the local dignitaries there were occupied with the Maubara-Lissa event, so they suggested we join them there instead, to provide entertainment for the crowds. This community and its neighbours don't often receive high-level guests like the President and government ministers, so they were busy preparing a warm traditional welcome for them, to offset the chilly weather in this location, which sits at an altitude of 1,500 metres. Despite the freezing weather, a crowd of 1,600 shivering people braved the cold to watch "Balibo", the movie that has moved and thrilled thousands of Timorese people during the Cinema Lorosa'e season, eager to watch this true-to-life cinematic portrayal of pivotal events in the country's history at the time of the Indonesian invasion. After seeing the enthusiasm of the cheering crowd, the Sub-district Administrator requested that Cinema Lorosa'e visit more remote areas instead of the big city because, he said, "the people in districts have no other entertainment and it is a more effective form of disseminating information". Huddled in their traditional hand-woven "tais", people brave the cold to watch "Balibo"
The people of Liquica also echoed the comments from the authorities in Maubara. After watching our screening of two short films, "Tour de Timor 2010" and "Vagabond", followed by that Timorese favourite, "Karate Kid", the crowd begged for more, reluctant to move when the show was over. in the Districts, not only in Dili!" Our next stop was Maubara, for a screening of "Balibo". Some of the events depicted in the film actually took place here and were re-enacted on this location when the movie was shot, so we were not surprised when a very emotional crowd of 900 people came to watch it in the town square. After the Maubara screening, many of the local people expressed their appreciation to us for the opportunity to see this important film, saying that it was a good way for the new generation to get to know some of the country's history. This has happened almost everywhere we have travelled. Sometimes, the journeys are exhausting, driving for long hour after hour over very bad roads, unpacking, setting up, de-rigging, loading the car again and setting off for the next remote corner of Timor-Leste. But then, you see the happy faces, the emotions, the excitement of the crowds and it's all worthwhile. We've seen some of the country's most beautiful scenery, participated in events of national and international importance and experienced the joy of achieving Cinema Lorosa'e's most important objective: bringing movies to the masses.